Microsoft's Business Applications are uniquely capable of helping you transform your business, enabling you to optimize your processes by connecting the key pillars of your business. You cannot name another business software company that can provide you with modern, integrated and intelligent applications for every part of your business process. Whether sales, marketing, operations, finance, HR, or customer service, Microsoft has an application for you. Built on a common data application and analysis platform called the Common Data Model (built on Azure), Microsoft's Business Applications are integrated with Office 365 (the largest productivity suite) AND the worlds largest professional network, LinkedIn. This combination can supercharge your business and is completely unmatched. Microsoft calls this solution framework the Digital Feedback Loop, and is confident (as am I), it will propel your digital transformation. 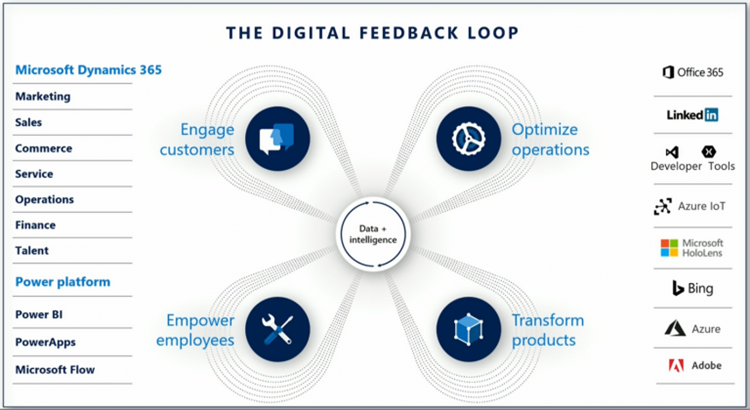 There are 5 pillars to the Digital Feedback Loop, at the center of which is data & intelligence. A deep understanding of your customer will enable you to design products & services that best meet their needs. When this customer data is are built into the feedback loop, you can deliver more effective and personalized products and services. Microsoft gives you applications like Dynamics for Marketing, Sales or Customer Service, which are mainly customer-centric applications designed to tailor individual customer experiences. They enable you to have the right processes, data and touch points in place so that you engage your customers in an effective way. That means having the right information, at the right time to make the right decision every time OR providing the customer with the information they want, at the right time, through things like customer portals - and Dynamics 365 gives you that. Just like with engaging customers - employees need the right information at the right time. But you also need to provide your employees with the tools they need to do their job more efficiently and effectively. These tools also need to be able to adapt to an ever-changing business landscape so that your employees can stay ahead of the curve. The productivity suite, business applications, and data analysis tools at your employees fingertips, cannot be matched. Not to mention, your employees will be able to collaborate any time, anywhere and on any device. Empowering employees with relevant data and the Artificial Intelligence (AI) to assist with the analysis of that data, will support your business across all of the other pillars. When companies think of digital transformation they sometimes leave out their operations team because they are stuck on some legacy application or their user group may not be the most tech savvy. But those days are changing as Microsoft has been coming out with powerful applications that can empower your field service, project, or finance & accounting departments. These applications improve responsiveness, service levels and reduce costs - leading to higher profitability. Microsoft obviously cannot make your products awesome for you... but it can help shift your vision from hindsight to foresight by providing the data and applications you need to make those key product decisions. Here again, a deep understanding of the customer will foster better product & service development by creating products that address customer needs. PowerBI is the application of choice for data visualization and integration. These analytics will help your employees make key decisions and reduce the complexity of static data. There are also built-in AI tools in Dynamics 365 like the Relationship Assistant, that serves up friendly reminders to complete tasks or answer emails. Not to mention, with the recent additions of AI for Sales, and AI for Customer Service, Microsoft is giving businesses the power of Artificial Intelligence to make (or help make) key decisions for you. In order to remain competitive, all businesses will need to recognize the importance of the digital feedback loop. Microsoft's business applications effectively facilitate the incorporation of data and business intelligence into decision making to transform businesses.